Disability Blog Carnival #32 is up now! Shiloh has rounded up a selection of recent posts that comment about the everyday frustrations, decisions, and strategies of living with a disability, in the snow, among clueless mattress salesmen, with wicked dreams of guerrilla bathroom modification... yeah, you're going to have to read to learn more about all that. The next edition of the Disability Blog Carnival will run on March 13, at Wheelie Catholic. Ruth has chosen the theme "Appreciating Allies." Deadline for entries is March 10--you can submit links at the blogcarnival.com form, or in comments here, or by emailing me--Ruth's blog doesn't allow comments, so that's not an option this round. Want to host an edition of the Carnival? Contact me! We have openings in April, June, and July to book now. That I succumb to fate? My thoughts and songs vibrate. Ukrainian poet Lesya Ukrainka was born Larysa Kosach on this date (more or less--depends on which calendar you follow) in 1871. From age 10, she had chronic joint and bone pain caused by tuberculous arthritis. In search of relief, she traveled a lot to warmer places, seaside towns on the Crimea, in Italy, in Egypt, and elsewhere. Her parents taught their children Ukrainian language and culture, when such things were banned in the Russian-run schools. As a result, she took the pen name "Ukrainka" (Ukrainian woman), and published poetry, drama, essays, and literary criticism, all informed by her study of Ukrainian folktales, history, and culture. Her controversial works had to be published in another part of Ukraine, outside Russian jurisdiction. 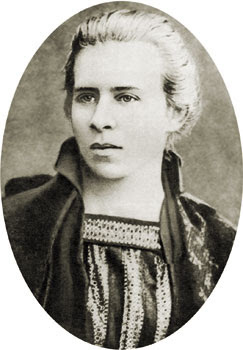 (She also published translations, including a 1902 translation of the Communist Manifesto, which got her arrested.) The ferocity of her cultural nationalism was often contrasted with her physical "frailty," a false contrast that provoked her to write the lines above. Today, there are monuments to Ukrainka throughout Kiev--and a boulevard named for her. There's also a monument to her at the University of Saskatchewan, and another in downtown Cleveland. Her image has been featured on Ukrainian postage, coins, and banknotes. At 23, Lynn Manning lost his sight completely as the result of a gunshot wound he received during a senseless bar fight. In WEIGHTS, his autobiographical one-man show, Manning brings the audience into a world of sound through storytelling, poetry, music and the rhythms of life around him. Manning illustrates the story of his upbringing in 1960s South Central Los Angeles, and the fateful incident which led to the loss of his sight. As he sets off down the road to independence, he must confront not only his fears and the new challenges of his everyday life, but the assumptions of others and his perceived weakness as a blind man in a sighted world. Since its debut in 2001, WEIGHTS has been performed across the United States as well as overseas, in such locations as Los Angeles, New York, Washington, D.C., Canada, and Croatia. In Los Angeles, Center Theater Group’s original 2001 production of WEIGHTS was not only critically acclaimed, but also won three NAACP Theater Awards, including Best Actor. As a television actor, Manning has appeared on 8 Simple Rules, Seinfeld and The Sinbad Show. Recognizing a need for theater and theater arts education in African American neighborhoods such as L.A.’s Watts community, Manning co-founded the Watts Village Theater Company and serves as both President of The Board and Literary Manager. This event is the third in the lecture and performance series Disability, Social Justice, and the Body, sponsored by Disability Support Services, the Columbian College of Arts and Sciences, Student and Academic Support Services, Multicultural Student Services Center, English, Sociology, University Writing, American Studies, and Women’s Studies. 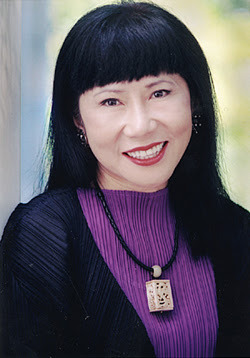 Popular novelist Amy Tan was born on this date in 1952, in Oakland, California. Readers who enjoy her fiction may not be aware that Tan has experienced significant neurological impairment from undiagnosed Lyme disease in 1999, as described in the quote above. She has a page at her website detailing her medical odyssey toward a diagnosis and appropriate treatment, and the everyday lasting effects of late-stage neuroborreliosis. It's also one theme in Tan's 2003 book of essays, The Opposite of Fate. Disability Blog Carnival #31 is up NOW! Able to leap tall buildings in a single bound, it's..... the Wheelchair Princess, with the latest edition of the Disability Blog Carnival, built around a "Superman" theme. What topics did folks write about for that prompt? Just the usual stuff.... pedestals, heroes, toast, acupuncture, teenagers, arbitrary school rules, history, philosophy, shape-shifting, secret identities, dogs, and yoga. (But not "dogs and yoga"--that comma is important.) Slip into your leotard and cape and hold on tight. Next edition will be hosted by Shiloh at Sunny Dreamer, where the theme "Standing Outside the Fire" has been set. No, I don't have any further information on that--UPDATE from Comments: Emma says it's a Garth Brooks song title--ask Shiloh or just write whatever that phrase stirs you to post. Deadline for submissions (in email at celtic_me2000@yahoo.com or at the blogcarnival.com form) is February 25, for a February 28 posting. As usual, thanks to all the writers and readers and hosts for bringing such excellent and diverse content to the Disability Blog Carnival. "Next time you see a young person in a wheelchair, tip it over and drag the occupant to the nearest job centre, lecturing him or her all the while on the dignity of labour." Moving across the Atlantic, the idea is already being put into practice--by one deputy sheriff in Hillsborough Co., Florida. Brian Sterner, a quad, was stopped on a traffic violation on 29 January and taken to the station for booking. Deputy Charlotte Marshall Jones didn't believe he was really paralyzed, so she dumped his wheelchair forwards, and he (surprise!) fell to the ground. The incident was caught on the office surveillance camera (video here, but be warned--it's distressing to see), and she has been suspended without pay. Brian Sterner, it turns out, is the former director of the Florida Spinal Cord Injury Resource Center, based in Tampa. He plays wheelchair rugby with the Tampa Generals, and he's working on a PhD. So, to recap, some young people use wheelchairs AND work AND drive. And throwing someone to the ground is a dangerously stupid way to prove anything. The graphic at left is a pie chart of this blog's traffic today, by country, thanks to sitemeter. Yes, today, almost a third of our visitors are coming from Finland. It was the same yesterday. Finland? Does Steve Kuusisto have something to do with this? No. Apparently there are a lot of drag racing fans in Finland, and one of them linked to one of my entries about Reggie Showers on a Finnish-language message board. So, Tervetuloa! "I'm just a loud-mouthed middle-aged colored lady with a fused spine and three feet of intestines missing and a lot of people think I'm crazy. Maybe you do too, but I never stop to wonder why I'm not like other people. The mystery to me is why more people aren't like me." Florynce Kennedy was born on this date in 1916, in Kansas City, Missouri. One of the first African-American women to graduate from Columbia Law School, Kennedy went on to help found the National Organization of Women, the Feminist Party, the Women's Political Caucus, and the National Black Feminist Organization. She used a wheelchair for many years, after several strokes and two heart attacks. This image is from Changing Times: Los Angeles in Photographs, 1920-1990, an online exhibit of Los Angeles Times photos, hosted by UCLA Libraries. I've drawn from this archive before, but this photo in contrast (or comparison) to so many photos from the polls this last week caught my attention anew. Glenn Switzer, the man being carried above, was a veteran disabled in World War I. To vote in Duarte, California, in 1940, he had to be carried by another man, Walter Howard. The ground looks muddy; those wooden planks are a makeshift sidewalk for pedestrian voters, but they're insufficient for Switzer's independent access, and they probably kept a lot of other folks from even trying to vote that November. We don't want our younger readers to miss out on this opportunity to be introduced to the world of theater. 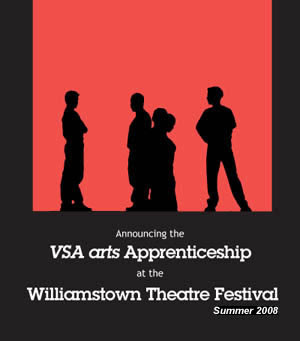 The VSA arts Apprenticeship at the 2008 Williamstown Theatre Festival in Williamstown, Massachusetts provides a unique insight into the world of a professional theater for students with disabilities, ages 19 – 24, interested in expanding their theater education and knowledge. Follow the link to learn more and apply by February 25th. 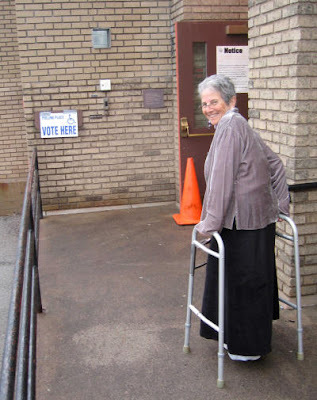 From the New York Times Polling Place Photo Project--this is Amy Pitt, voting (with a broken ankle) today in Rochester NY. Amy Pitt is (or was, in 2004) active with Metro Justice of Rochester, "an independent, grassroots, progressive membership organization, seeking a peaceful and just society....[working] for human rights, total equality, and economic and environmental justice by raising community awareness and engaging in non-violent direct action." More accessibility-related images in the project (so far, I'll keep adding links as I find more): "Stairway to Democracy" by Brian Scott (San Francisco CA); "Handicap Access" by Kirk Bravender (Chicago IL); "QH Sign" by Anonymous (Jacksonville FL); "Privacy" by Daniel Goscha (Urbana IL); "Vote Here!" by Anonymous (Minneapolis MN); "Other Arrangements" by Eric Talerico (Sierra Vista AZ); "Primary Distortion" by Marcus C. Emerson (San Diego CA); "A Chance for All" by Anonymous (Knoxville TN); "South Philadelphia" by Anonymous (2006 Midterms, Philadelphia PA); "Birmingham, Alabama" by Louise McPhillips; "Easy Access" by Nancy Wynn (Glastonbury CT); "Access to the Hawaiian Democratic Caucus" by Bruce Behnke (Pearl City HI). Joined together as we are, there could be no such thing for either of us as a private life.... We are believed to share identical thrills, pains, and even diseases. The truth is that we are as different in our reactions as day and night. I, Violet, often weep over something which makes my sister chuckle. I had whooping cough a year and a half before Daisy. We did not even catch measles from each other. Conjoined twins Violet and Daisy Hilton were born one hundred years ago today, in Brighton, England. Their childhood was marked by exploitation and abuse, when they were displayed worldwide, and their earnings were kept by the family that, essentially, bought and owned them. At 23, they won a lawsuit for damages against their handlers, and won their legal independence too. They remained on the vaudeville circuit through the 1940s, then settled in Miami, where they ran a snack shack. They died in 1969, from the flu, at their home in Charlotte, NC. In twenty states, tomorrow is a presidential primary (and it's also Mardi Gras--so vote first, then party). 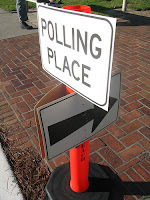 How accessible is your polling place? The New York Times Polling Place Photo Project isn't primarily intended to document accessibility, but by collecting images of polling places this election year, they may inadvertently create such documentation. So take a picture tomorrow, or whenever you vote; and if you can, show any access features or barriers for disabled voters. UPDATE 2/5: My polling place is a senior center, so the wheelchair access is fine.